Two Kradmelder ("Despatch Rider") struggle with their Bayerische Motoren Werke Aktiengesellschaft (Bavarian Motor Works Incorporated, or BMW) R75 motorcycle with sidecar during the Rasputitsa (Russian for "time without roads") in Fall 1941. Their Mantels (Rubberized Coats) are better protection against the mud then the average Landser (soldier) but they are still covered in it. As the Germans attempted to conquer Moscow before the snow fell, massive rains turned the dry steppe into a quagmire. Wilhelm Pruller (1916- ), a Sergeant in the 9th Panzer Division, wrote in his diary in July 1941, "We spent the night in the open. We made ourselves dugouts and covered them with sailcloth. After midnight it began to rain, and we couldn't stand it much longer in these holes. Wet and shivering with the cold, we waited for morning...When I see even at this time of how our vehicles, after it's rained a little, can barely make the grade, I just can't imagine how it will be in autumn when the rainy period really sets in...Yesterday it began to rain, and it hasn't stopped yet. It's enough to make you desperate." On August 4, 1941, a German Corporal wrote home, "The roads here are incredibly bad. At times of rainy weather hardly passable; fatiguing for man and horse. In general, you cannot get through any more with a motorcycle or auto." The BMW R75, of which 18,000 were made from 1941 to 1944, was one of the few vehicles that might make it out of a sticky bog, but the cloying mud went on for miles, and the mud stopped engines from running and exhausted horses and men. Germans and Russians alike were covered in mud until the winter freeze allowed movement again in November; soon after that, heavy snows set in. Some of the Red Army units had anti-freeze and winter uniforms, but the Germans did not. The ability to maneuver in Winter weather would give the Red Army's offensive an advantage. Two Kradmelder ("Despatch Rider") struggle with their Bayerische Motoren Werke Aktiengesellschaft (Bavarian Motor Works Incorporated, or BMW) R75 motorcycle with sidecar during the Rasputitsa (Russian for "time without roads") in Fall 1941. Their Mantels (Rubberized Coats) are better protection against the mud then the average Landser (soldier) but they are still covered in it. As the Germans attempted to conquer Moscow before the snow fell, massive rains turned the dry steppe into a quagmire. Wilhelm Pruller (1916- ), a Sergeant in the 9th Panzer Division, wrote in his diary in July 1941, "We spent the night in the open. We made ourselves dugouts and covered them with sailcloth. After midnight it began to rain, and we couldn't stand it much longer in these holes. Wet and shivering with the cold, we waited for morning...When I see even at this time of how our vehicles, after it's rained a little, can barely make the grade, I just can't imagine how it will be in autumn when the rainy period really sets in...Yesterday it began to rain, and it hasn't stopped yet. It's enough to make you desperate." On August 4, 1941, a German Corporal wrote home, "The roads here are incredibly bad. At times of rainy weather hardly passable; fatiguing for man and horse. In general, you cannot get through any more with a motorcycle or auto." 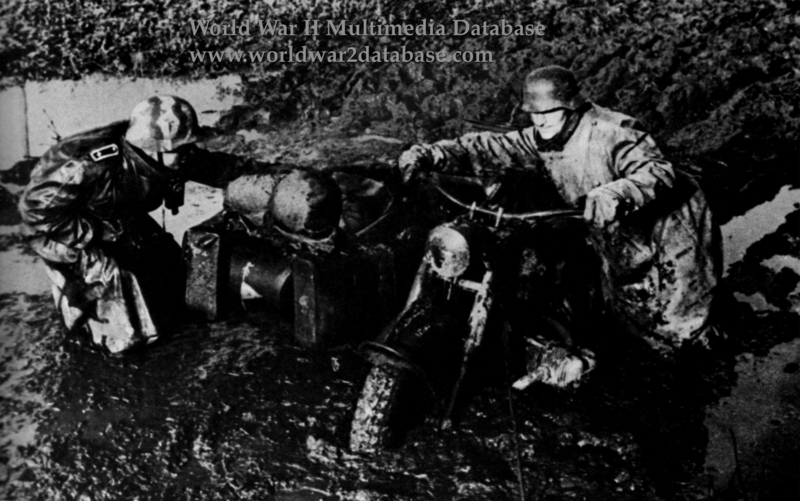 The BMW R75, of which 18,000 were made from 1941 to 1944, was one of the few vehicles that might make it out of a sticky bog, but the cloying mud went on for miles, and the mud stopped engines from running and exhausted horses and men. Germans and Russians alike were covered in mud until the winter freeze allowed movement again in November; soon after that, heavy snows set in. Some of the Red Army units had anti-freeze and winter uniforms, but the Germans did not. The ability to maneuver in Winter weather would give the Red Army's offensive an advantage.